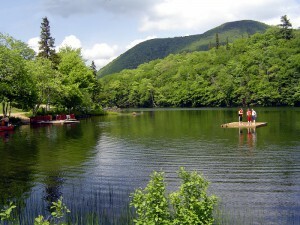 Welcome to the Lakes Campground, Restaurant & Cottages in Cape Breton Nova Scotia. The property offers eight well-spaced housekeeping cottages in Cape Breton Nova Scotia. It is situated on the Cabot Trail at beautiful Lake O’Law. Surrounded by the Cape Breton Highlands, and the lovely Margaree River Valley, The Lakes offers natural beauty and sparkling waters that you will remember for life. Whether you are staying in a cottage or camping, you will find the atmosphere friendly and gently relaxing.